The “Romaría” to Nosa Señora da Barca, in the town of Muxía (A Coruña), is one of the most important and most traditional in Galicia. This pilgrimage is as old as the foundation of its first chapel, in the 11th and 12th centuries, and is declared a National Tourist Interest. It is celebrated during the second weekend of September, being Sunday the culminating moment of the celebration with a procession that crosses several streets of Muxía on the road to the Church of Santa Maria, where the Virgin is received until the following day. Thousands of people flood the streets of the village during those days to honor their patron. People come pilgrims from distant places to enjoy this party where they perfectly combine devotion and fun. The road that leads to the sanctuary, bordered by the typical candle and thread posts, is a hive of people going to mass. At the end of this, the Virgin leaves in procession until the port, where she realizes the blessing of the waters. On that day, in addition to tasting the fish stews typical of the area, also visit its famous stones. And is that the cultural history of Muxia is linked to both the Sanctuary of A Barca and the stones of its surroundings. But did you know why? Legend says that when Santiago preached the gospel in these lands, in a moment of desolation due to the little success achieved in his preaching, he received the visit of the Virgin on a stone boat in which angels rowed, which gave him encouragement to that the apostle continued his evangelizing work. As proof of its appearance, the boat of the Virgin was shaped in the rocks. Years later, the image of the Virgin was discovered under the helm of the boat and proceeded to its transfer to the parochial church but, inexplicably, it reappeared in its original place. 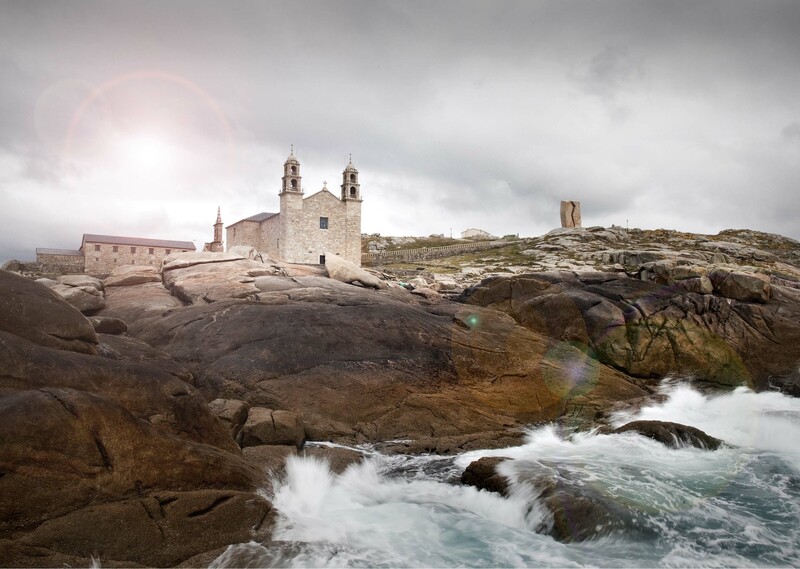 Before this miraculous fact, the inhabitants of Muxía decided to build a sanctuary to honor the Virgin, and it is in the surroundings of this sanctuary located next to the sea where they are the rocks used in a pagan cult rite that soon was Christianized. They are “Pedra de Abalar”, “Pedra dos Cadrís”, “Pedra dos Namorados” and “Pedra do Temón”. This cult of stones, very common in Galicia, probably owes its origin to the pre-Roman times and, apparently, its Christianization is due to the monks of Muxía. “A Pedra dos Cadrís” is an indispensable visit for all those who suffer rheumatic problems, for which they have to pass underneath it nine times. “A Pedra de Abalar” produces a mysterious sound to which the popular tradition attributes a multitude of powers. According to count, the sound only takes place in case to be innocent and to be free of sin. There are also those who say that the stone emits its sound alone as a warning of a shipwreck or some other misfortune. “A Pedra do Temón” owes its name to it, always according to legend, is the hull of the boat in which the Virgin appeared. Finally, “A Pedra dos Namorados”, the only stone of A Barca whose tradition is not related to the Marian legend. It has a form of seat with a large backrest in which couples promise love and fidelity. All of this makes the Romaría de Nosa Señora da Barca, therefore, a really magical one. Do you want to discover it?